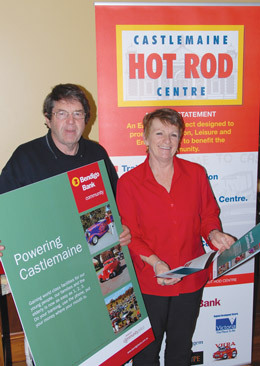 The Castlemaine Hot Rod Centre has partnered with Bendigo Bank, forming the ‘Powering Castlemaine‘ Community Enterprise Scheme. Castlemaine Hot Rod Centre Chairman, Larry O’Toole, said the initiative empowers the community to turn a fantastic idea into reality. “Powering Castlemaine will direct money to a community resource centre that will provide support and facilities for young people, families, elderly and visitors to our region,” he said. The Centre will also provide vehicle inspections and certification, driver education and specially designed event promotion areas for swap meets, car shows and major product launches. Bendigo Bank’s Tim Rodda said supporting Powering Castlemaine couldn’t be easier. “These commissions will be paid to the Castlemaine Hot Rod Centre to develop its facilities, similar to Community Enterprise Schemes already operating in other parts of Victoria,” he said.